Have you ever walked in someone's yard for a while, and then realized that something smelled like day old meat, corn, grass, and dirt? And then, upon looking for the smell, you realize that it's you. So you proceed to investigate yourself, smelling your underarms, your hands, your shirt, and then finally looking under your shoe. And you spot it. Green, brown, mushy, crumbly, smelly...poo. You have stepped in one of the notorious traps neighbors leave for each other in their yards. Then dog-poo land mine. Now, I live in an apartment, which means that I am yard free. And all of my friends live in similar apartments, thus being yard free. This means that I don't run the risk of surprise squishy land-mines. At least I thought I didn't. But then I walked down the stairs at my school. As my foot came off of one step to descend to the next, with all of my body weight behind it, I felt a crunch. And then a squish. First, I caught my balance. Then, I looked for source of the problem. It was a small paper cup. But in the small paper cup was a reddish-orange sauce that smelled like sweet, salty, chili sauce. And in that sauce were thick, white rice noodles. It had happened, not in a backyard, but at work, in a school, on the stairs. I found the Dokk Boki bomb. Innocent students who love life and having fun also love eating Dokk Boki as a snack between classes. And if there is one thing we all know about students, it's that they're not too considerate when it comes to school cleanliness. I have seen these stained red paper cups on walls, window-sills, desks, and tables. But never have I seen them on the floor. My innocent students were innocent no more. Without knowing it, they waged war on the bottom of my foot. They absent-mindedly set small, sweet smelling, squishy land-mines for me to step in. But it's not only me! It's the other teachers too. And after every class, the students and teachers naively walk out into "no man's land" to make it back to the classes/offices. But, everyday, there are casualties. Because we wear sandals inside, we sacrifice our socks to the violence of the Dokk Boki bomb. And so, I sit here peeling off another Dokk Boki sock, preparing for the hallways tomorrow. Oh, and by the way: Some pictures of my co teachers and students! Recently, I had a discipline issue in one of my classes. This class is particularly energetic which often leads them to yelling loudly at each other, throwing things across the room, and sometimes putting each other into headlocks (usually before class). During class they focus their energy on one thing, not paying attention. And let me tell you, these girls can not pay attention better than any students I have yet to encounter. Their lack of attention usually manifests itself into talking over their beloved teacher, looking in their tiny mirror for 50 mins, doing homework for other classes, and yelling in Korean at fellow classmates. Now not all of the students are bad, I have two groups of girls that are quite wonderful. They participate, ask questions, and listen. I mention this because they will come into play later, so remember, two groups of angels. Moving on, I have come to expect bad behavior from this class and to not let it bother me too much. But today, something just snapped. Today, three of my students decided it would be permissible to go to a store across the street in between classes, buy a pile of snacks, and bring it to my class. You should know that students are never to leave campus during school hours, they are neither allowed to bring food into my class. So I see them enter 10 minutes late with their bounty of food. I immediately grab a bag, walk over to the students and, despite their cries of protest, make them deposit ALL of the food they purchased into the bag. 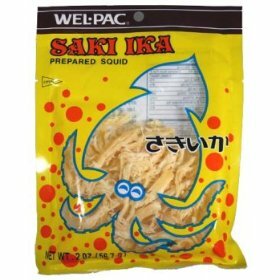 But now I had a different problem, I now had a bag full of snacks that I wasn't going to return to them and I certainly wasn't going to eat (squid jerky isn't really my thing). So I put it in my drawer and decided I would deal with it at the end of class. Class continued, the students didn't listen, class ended. I kept the class for a short time after the bell to let them know how disappointed I am and blah blah blah...then I remembered the food. I looked over at the perpetrators and retrieved the food from my drawer. "Most of you chose to learn nothing today, you talked, you refused to listen, and you brought food to my class. But two groups listened and participated, so I am going to give them your food." You may be thinking, "Another post about festivals? Isn't that what they talked about yesterday?" If you are not thinking this then chances are you have lived in Korea. There is a festival nearly every weekend here and because Korea is roughly the size of Indiana we are able to go to whichever ones we want. And today is your lucky day, because now you can go to whichever ones we want too! The festival took place in Seoul Plaza, it was like an oasis in the center of the big city. Children played. Meanwhile, we practiced our dance moves. But by far the coolest part was one of the amateur drum groups, at one point they leapt from the stage and did some water drumming, it was amazing! 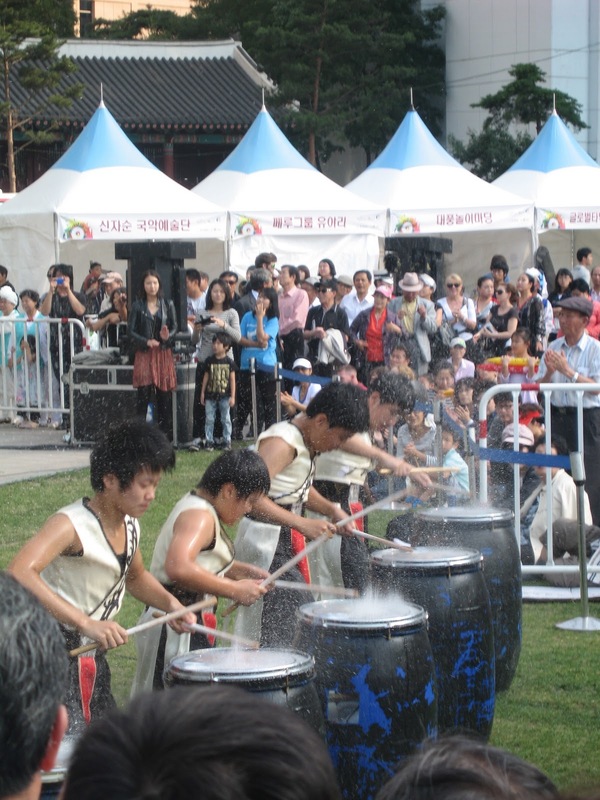 Overall, the Drum Festival was a huge success and made us feel very involved. The International Dance Festival, though lacking in interactivity, was abundant in culture and history. 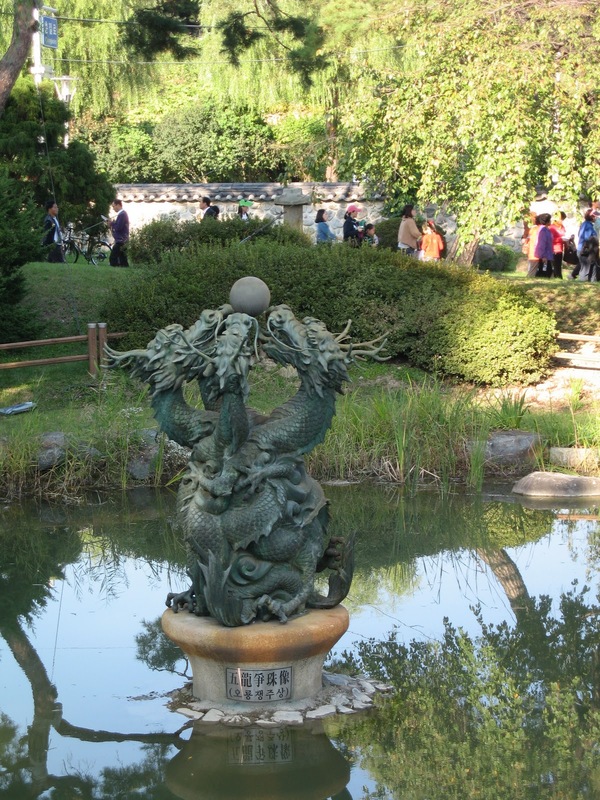 It was held at the beautiful Samgeori Park in Cheonan. Our first attempt to attend was thwarted by our lack of knowledge regarding the Cheonan bus routes and reluctance to take a taxi. On the second try, after doing some intense internet research, we discovered that a bus we take nearly everyday (shout-out to Bus 12!) ends up at Samgeori Park. Aside from the spectacular swashbuckler performance, one other stands out in my mind as particularly interesting. But in order to fully enjoy this anecdote, you will need a brief history lesson. For those of you who have been following our blog, you will remember that a few months back we visited Independence Hall, a museum commemorating Korea's fight for independence under Japanese occupation. Japan's rule over Korea from 1910 until 1945 included cultural suppression, torture, murder, forced labor, and the abduction of women to be used as "comfort women" in military brothels by the Japanese in WWII. Recently, there has been some controversy revolving around a small island in between the two countries called Dokdo Island. When I say small, what I mean is the island has a permanent population of TWO people. The remaining 30 inhabitants are military stationed to protect the island. At one time, Japan sent emissaries to Korea to "give" them the island, but Korea refused to let them past the airport gate and sent them back to Japan because Japan can't give them something they already own. Needless to say, current relations between Japan and Korea are tense. Now that you have some context we can come back to the dance. The performers were all Korean students, and they chose to do an interpretive sword dance. It begins with a group of Koreans happily going about their business, waving Korean flags. Then suddenly a group of Japanese soldiers rush in and begin shooting, stabbing and rounding people up for slavery. At one point a Japanse soldier snatches the Korean flag and stomps on it. After a few minutes of demonstrated Japanese oppression, two Korean men dressed in black and wielding swords fight and kill the Japanese soldiers, leaving Korea to be free at last. To end the spectacle they pulled a HUGE banner (Korea is really into banners) over the stage that said: "DID YOU KNOW? 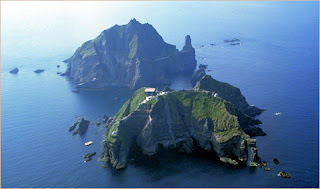 DOKDO IS KOREAN TERRITORY!". Did anyone else notice the banner is in English, not Korean? I have a theory on this. Now keep in mind, this is an international dance festival where multiple Japanese dance groups are performing. Also noteworthy, both the Japanese and Korean governments are pouring money into English programs (hence my current employment with the City of Cheonan Dept of Education). So I pose that they did not want the banner to be in Korean because then the Japanese attendees would not get the message. But they certainly weren't going to make the banner in Japanese lest the other hundreds of people not get the message. 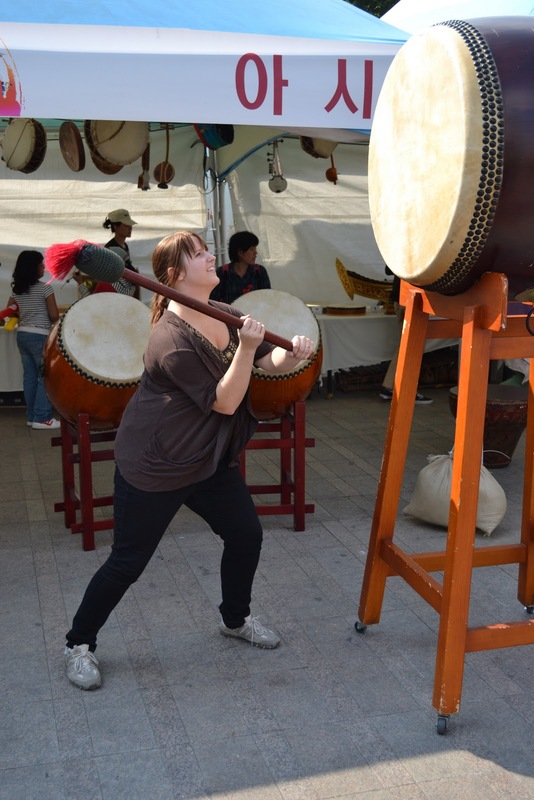 Well here's from me to you, Korean student sword dancers, message received. 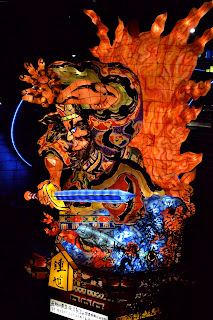 So the last festival is the Lantern Festival, we actually just attended this festival five days ago in Seoul. It was so wonderful and breathtaking that I think I'll just let it speak for itself. 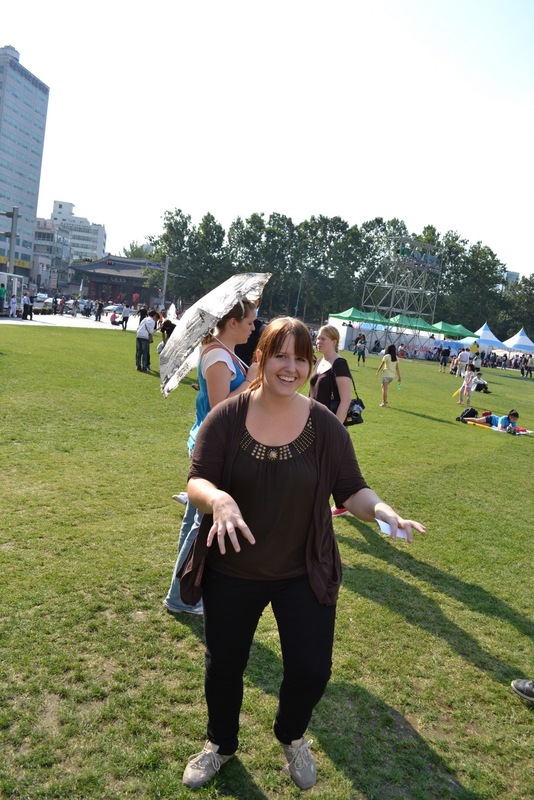 When we first arrived in Korea, I must admit, I knew very little of the Korean culture. Some interesting facts: their culture has survived for 5000 years; they have preserved their own language from invasions of Russia, China, and Japan; and they have preserved the stories and traditions from their ancient clans. So we woke up with the sun and jumped on a bus, bundled up in warm clothes, as the cold was setting in. We then traveled east, toward the rising sun, watching the land move from the rolling mountains of the west to the more rugged mountains of the east. We even met a Korean man who spoke English with an Australian accent. We finally made our way to the festival. It is what one would assume from a festival: fried foods, tchotchkes. But the greatest part of this was getting to see the various faces that cultures had created to turn a normal person into a mythical character. We even had the opportunity to create our own masks, but we didn't yet understand the meaning behind them. As we toured the festival, we kept stumbling into "Alice in Wonderland" type creations. We stumbled through a field of mushrooms. And were attacked by large "go fish" fish. As we emerged from the mysterious creations of Korea, we were immediately dragged into a street parade. Forgetting any concept of difference between people, language, religion, etc., we were grabbed band pulled into the dance, jumping, leaping, spinning, and whirling with all of the people in the parade. The dancing continued, with people in masks, costumes, and even directing puppets. The excitement was phenomenal. And it wasn't for any holiday, but only for a cultural festival. Exploding in lights and confetti, the entire festival was covered in flying color, spinning color, and even the color of musical sound. But we still did not fully understand why Andong celebrated the masks. So we went to the Hahoe mask dance and play. It was a play whose goal was to equalize the working class and the aristocrats of Ancient Korea. 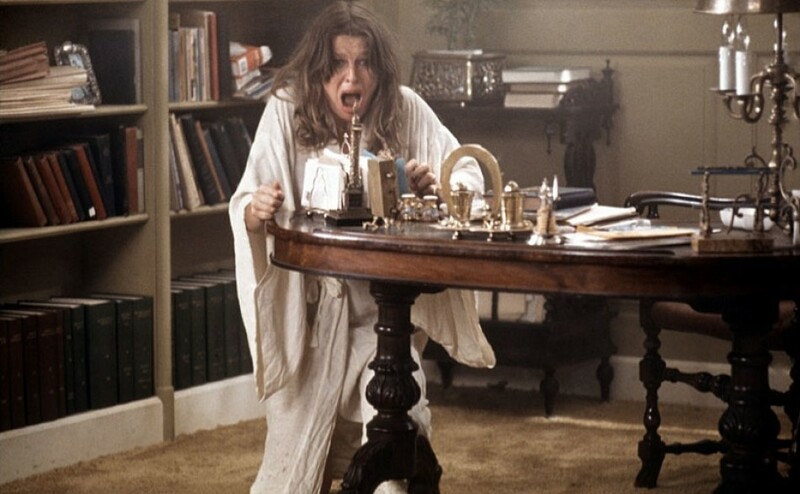 It begins with two acts: the butcher and the bull (the butcher is attacked by the bull, but kills it, cuts out its heart and testicles), and the hunched weaving woman (bemoaning her work). The play then takes a sharp turn, presenting a perverse monk who stalks an aristocratic woman on a walk. The trickster character constantly dances on the outside, commenting on the hypocrisy of the monk, and the ludeness of the aristocrats. The play ends with a scholar and an aristocrat trying to outwit each other. They both hold long pipes that require servants to light them (showing their wealth). The trickster constantly poses questions to them, and watches them debate each other. In the end, the butcher comes in with the bull testicles, and offers them to the scholar and aristocrat, promising that the testicles will bring strength and sexual prowess. The two fight over them, but the old woman wins them, waving them in the faces of the aristocrats. With this final act, all of the characters are equalized. Thus, the masks allow a anonymity for the people to become equal actors, and to equalize the roles in society. Finally, it all ended with the magic of the dance of the King of Masks. This King of Masks changes masks throughout the dance, but no one ever sees the change. He can become whoever he wants with the wave of a hand. Changing from red, to green, to orange, to white, to black, to his normal face, and then back again. The night ended with a dance from an Israeli dance troop who brought inanimate metal and plastic to life, making it look as though these mundane work materials had a life of their own, becoming snakes, people, jellyfish, and like children playing with toys. It all ended with a metallic dance to Bohemian Rhapsody. And then we returned to the land of the mundane reality. However, we will always the escape into the masks.